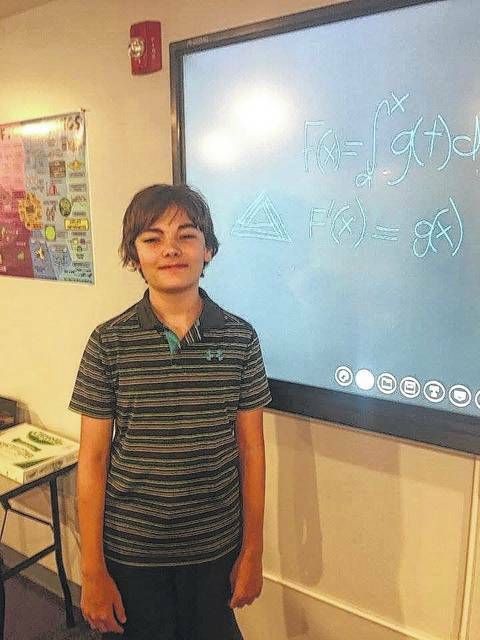 Some students dread the idea of math class, but that isn’t the case when it comes to local student Connor Yost (Hartop), who was recently named one of brightest middle school students in the world by John Hopkins Center for Talented Youth (CTY). According to the CTY, as well as test scores to back up the statement, Yost, a middle school student at Portsmouth STEM Academy, scored in the 99th percentile on a rigorous, above-grade level mathematics test. He was even rewarded for this achievement at a ceremony sponsored by John Hopkins CTY. This is no easy task to accomplish, according to CTY. Students from more than 65 countries participated in the CTY Talent Search and only the top performing students were honored. Yost is thriving at Portsmouth STEM (Science, Technology, Engineering, and Mathematics) Academy, where he is one of the school’s earliest students. He now takes many of his classes as a postsecondary student of Shawnee State University as well. Yost said that his family drove him to Charleston, West Virginia for the test, where he said he took it on a computer and wasn’t told of his scores until later. “I was surprised I did so well. I was happy and honored,” Yost humbly explained. While he enjoys downtime with his family and friends, Yost often thinks of the future, particularly his future place in a field he loves. The young student says that he would like to pursue degrees in three subjects, math, chemistry, and astronomy.